Is America becoming Israel's enemy? The relationship between the United States and Israel has not been this battered since Gerald Ford was president, sparring with Israel after their refusal to withdraw from Egypt's Sinai Peninsula, which Israel eventually did. There were some rocky moments since then between President Ronald Reagan and Israel over Israel invading Lebanon and bombing Iraq's nuclear reactor, as well as American actions over the U.S. selling air defenses to Saudi Arabia. Again in 1991, President George Bush, Sr.'s government denied loan guarantees to Israel over disagreements on West Bank settlements. Those past disputes were merely disagreements among committed friends, though. Today the tone has become far, far worse. 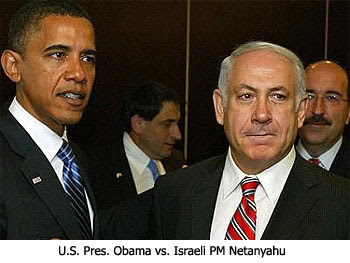 The United States and Israel began to see rapid deterioration in their relationship as soon as President Barack Obama took the reigns in January 2009. President Obama began his term of office by reaching out to Muslims in a speech in Cairo, and since then has repeatedly given his ear to Israel's enemies while publicly berating Israel at every opportunity. With world public opinion set hostilely against Israel over the fallacious Goldstone Report which accuses Israel of war crimes in Gaza during Operation Cast Lead, Israel needs a real friend that doesn't talk like an enemy. Mr. Obama next began calling for something no previous administration has insisted on. He demanded that Israel completely halt all "settlement" activity in the West Bank and in East Jerusalem. For Israel supposedly being one of America's closest ally, Mr. Obama has yet to visit Jerusalem as president. Politically such a disregard is considered a snub. How has the United States responded to Israel's threat to their very existence? Israel now faces a crisis of epic proportions as Iranian Muslim clerics and their President Mahmoud Ahmadinejad are hell-bent on developing a nuclear weapon and arming terrorist regimes like Hamas and Hezbollah to follow through on their threat to "wipe Israel off the map." The world has tried every diplomatic means possible to curtail Iran's development, but every effort has been met with a slap in the face by Ahmadinejad. All attempts at placing serious sanctions on Iran have been vetoed due to the gas interests Russia and China have in Iran. American support of Israel in their dealings with Iran has ironically only been friendly to Iran. The World Tribune reports: "Since taking office, Obama has refused to approve any major Israeli requests for U.S. weapons platforms or advanced systems. Officials said this included proposed Israeli procurement of AH-64D Apache attack helicopters, refueling systems, advanced munitions and data on a stealth variant of the F-15E." And the latest, President Obama has blocked a 2008 deal to deliver to Israel bunker-buster bombs capable of destroying underground facilities such as the Iranian nuclear weapons sites. The bunker-buster bomb is a "2,000-pound bomb, produced by Boeing and coupled with a laser guidance kit" that "was designed to penetrate concrete bunkers and other underground hardened sites." While en route, the U.S. military was ordered to divert the shipment of 387 bunker-buster bombs from Israel to a military base in Diego Garcia. What the Obama administration is effectively doing, according to the World Tribune's congressional source, is to place an embargo on Israel. This makes good on U.S. Secretary of State Hillary Clinton's threat to reduce military aid to Israel because of its construction policy. With Iran just a year away from having two atomic bombs and already proving they have the delivery missile system capable of delivering a warhead to anywhere in Israel, Washington's timing couldn't have been worse. The Obama administration believes that once the Palestinians have their own country Iran will back down, naiveté at its best considering Iran is willing to irradiate the very land they say belongs to the Palestinians. The Palestinians are a pawn to Iran and nothing more; a pawn that Washington is too focused on, missing Iran's larger and often announced ambitions to bring Shiite Islam to the whole world. Having proven historic ownership of Jerusalem since King David 3,000 years ago, only since the Six Day War of 1967 has Israel again regained control over Jerusalem, having lost it when the Babylonians conquered it in the sixth century B.C. 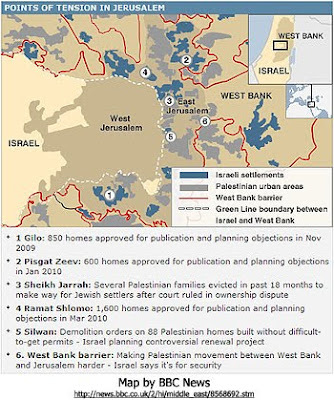 Though contested by some Muslim nations, by all legal rights Israel owns Jerusalem and has the right to build on their own land. As Israeli Prime Minister Netanyahu confirmed in a March speech to the pro-Israel lobby group, Aipac, "Jerusalem is not a settlement, it's our capital" and Israel has a "right to build." The Obama administration sides with Israel's enemies, declaring the left-over Syrian invaders now called Palestinians have the right to the eastern portion of Jerusalem and all the West Bank lands in the very heart of Israel. President Obama has made the freezing of all Jewish construction the paramount factor in Israeli-Palestinian peace negotiations. His eventual goal is to forcibly make Israel cede East Jerusalem to the Palestinians as their capital, rather than Ramallah, and set up an independent Palestinian nation. Below the surface of the souring American-Israeli relations is President Obama's well known ego. The continuation of Israel building apartment complexes and businesses on their own land against President Obama's wishes has been taken by the President as a personal insult — ultimately as an act of disobedience. BBC News reports that U.S. Secretary of State Hillary Clinton has expressed Mr. Obama's anger by calling Israeli Prime Minister Netanyahu's continued defiance of Obama's will by continuing construction "insulting." David Axelrod, an aide to President Obama, has dubbed Netanyahu's persistence "an affront" and a "calculated attempt to undermine the expected launch of indirect talks." Vice President Joe Biden in his March visit to Jerusalem displayed Mr. Obama's contempt by showing up hours late to all of his meetings and publicly berating Israeli officials on their own soil. The bedrock reason for Americas' continued distancing from Israel is the fulfillment of Bible prophecy. Israel is in the processes of regathering from the four corners of the world back into their own land, which is a fulfillment of Isaiah 11:11-12. Israel becoming a nation again as it did on May 14, 1948, was a fulfillment of Isaiah 66:7-8 and Ezekiel 37:21-22. The Jews reoccupying the city of Jerusalem found its fulfillment on June 7, 1967, as Zechariah 8:4-8 said they would. The Jews restored the barren land making it fertile again, just as Ezekiel 36:34-35 said would happen. And finally, the reason for America's increasing hostility towards Israel, the fulfillment this very day that all the nations of the world will come together against Israel over the issue of the control of Jerusalem, as written in Zechariah 12:1-3. The United States has been soured by Satan's hatred of the Jews. Satan hates the Jews with a passion because through them God brought the world the Messiah and His salvation, the Bible, and the promises of future restoration. Israel fulfilling Bible prophecy today proves that God's destiny for Satan — the Lake of Fire — is unalterable and conclusive (Rev. 20:7-10). God never brings about judgment without forewarning, for He is a just and loving God. The Bible says that God will bless those who bless Israel, and He will curse those who curse Israel (Gen. 12:3). The Bible also says that he who touches Israel touches "the apple of God's eye" (Zech. 2:8). In the Bible, whenever a leader disobeyed God (such as King David did when making the census), the people also paid the penalty. God's method of operation has not changed, and the American people have paid the price for our elected leaders' sins against God. We have injured ourselves by trying to divide Israel, just as Zechariah 12:3 warned. We will continue to pay the price for our leadership's stand against Israel and God Himself, ultimately being destroyed as a nation when we side with the Antichrist against Israel in the last days. Christians should prepare for God's warnings through natural disasters and economic chaos by humbly calling out to God to forgive us, holding back His anger against the United States, at least until after the Rapture. During hardship we should continue doing as we've always done — pulling close to God in prayer and Bible reading, living holy lives, and using the time we have to share the Gospel with others. In these tumultuous and terrifying times, as our leaders rocket us to our own nation's destruction, we should heed what Psalm 56:3 teaches us concerning God, "When I am afraid, I will trust in you." My question is this...how do you connect the dots between those events? And yes to Billy, Osama...er...Obama is definitely a moslem. No questions about it. He said during the elections or whenever that when the political winds blew he would side with the islamists. The leftist liberals got all upset when we pointed that out and said it wasn't true, but they were just deceived and/or were just as anti-semite as Obama is. Excellent post, Nathan Jones! It drew me straight in here. Hey, I fully agree with Sean Osborne, a first poster, on unity. I also liked the suggestion of an earthquake under the White House. Would that it were that simple! My best wishes to all--carry on! Clarification...I'm not saying I'm right...I just don't understand it. Sorry for these posts...after re-re-re reading the article you referenced to me, Nathan, I've decided I was wrong. * How can "all" be literally "all" if even one nation -- for example Jordan -- is able to escape his hand (Dan 11:41)? Rev 13:8, "And all that dwell upon the earth shall worship him, whose names are not written in the book of life..."
Zechariah 14:2, "For I will gather all nations against Jerusalem to battle; and the city shall be taken, and the houses rifled, and the women ravished..."
Zech 14:2, "For I will gather ALL nations against Jerusalem to battle; and the city shall be taken, and the houses rifled, and the women ravished; and half of the city shall go forth into captivity..."
Rom 5:3-4;8:35, "And not only [so], but we glory in tribulations also: knowing that tribulation worketh patience; And patience, experience; and experience, hope ... Who shall separate us from the love of Christ? [shall] tribulation, or distress, or persecution, or famine, or nakedness, or peril, or sword?" Nathan says, "Mitchell, you CAN write about something else other than dismal Post-Trib counter-arguments. Encouraging, too - way to go, Man! This is a breakthrough. :)"
"Mitchell, you CAN write about something else other than dismal Post-Trib counter-arguments. Encouraging, too - way to go, Man! This is a breakthrough. :)"
...needle static - ...shhhhhh tribulation! A casual glance at history is enough to answer that. As Dr. Stuart Crane pointed in his classic "Proofs of a Conspiracy", there is no such thing as a true "monarchy". Even the most primitive tribal chief must have his braves to help him maintain his position. Every king has his dukes and vassals, Hitler - his Goerings and Himmlers, and Lenin - his Trotskys and Stalins to help them rule. Big things are in store for the nation of Israel. Keep an eye on them - they're God's prophetic timeclock. Nathan....great job explaining what is going on. I would just like to officially go on record as saying that I support Israel...my heart goes out to them....despite what our government is doing. Does God know that? I really want Him to know that I am not a part of what the Obama is doing.